4 easy steps to make your home “the” best stop for Santa Claus. Santa Claus visits every household in the world in one night! That means that it takes special steps and attention to details to make your home “the” best stop for Santa. 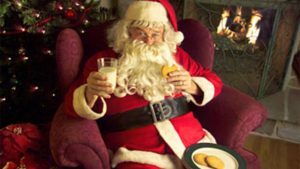 Leave a lasting impression on Santa during this year’s Christmas and make your home a location Santa Claus will eagerly want to stay and enjoy. Guide Santa to your home! Make your home easy to find with bright lights adorning your exterior. You can do this in a variety of ways. A good example is like how airplane pilots need lighting on the ground provided by the airport staff. You need to guide Santa’s reindeer to where he needs to land when he arrives. The easier he can see the faster he can land and the sooner he can have a jolly good-time in your home. Clear a path. Santa Claus is traveling in and out of an array of homes during Christmas Eve, so you can see why providing a clear path for Santa with a clean home and clean floors is critical to a great overall visit. Also, Santa Claus likes to be very quiet when he enters an home, so this helps! This way everyone in the household can stay asleep and be fully rested for Christmas morning. Munchies are the best! Place your cookies and milk out for Santa to enjoy. Because Santa Claus is visiting countless homes provide him a space where he can sit down and enjoy his yummy treats. Also, don’t forget about the reindeer! When you feed them, Santa doesn’t worry about getting them up in the air faster. He has more reason to sit and enjoy. Provide them with some reindeer food. Even add glitter to the Reindeer’s food and help better guide them to where to land. The moonlight will help the glitter shimmer on your lawn. HERE IS A RECIPE! Cozy-up with a good read. Now that Santa is sitting and enjoying his treats, while the reindeer are doing the same, make sure to leave Santa Claus a note. Thank him for his visit to your home but also share with Santa Claus what you love about your home and family. Santa wants to know all about you and what makes your life so special. He will then sit and enjoy not only his delicious edible treats but also the treat of your stories. Oh and before you get too preoccupied with all things holiday, don’t forget to drive around the neighborhoods in Cheyenne to see how your neighbors are preparing their homes for Santa’s arrival! It’s going tto be end of mine day, but before finish I am reading this great paragraph to increase my know-how.